This most interesting surname, prominent in Devon, Cornwall, and Wiltshire, is of Anglo-Saxon and Cornish origin. Firstly, it may be of Anglo-Saxon origin, as a variant of Elcot, a locational name from places so called in Berkshire and Wiltshire. This placename is composed of the Olde English pre 7th Century personal name "Ella", a short form of various compound names with the first element "aelf", elf, and the Olde English "cot, cote", a cottage, shelter for animals. 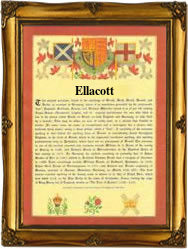 The name is also of Cornish origin, where it derives from some lost or unidentified place called Ellacott, Ellicoat or Elcoat. The placename is composed of the Cornish personal name "Elli", probably from the Welsh (Celtic) personal name "Elisedd", a derivative of "elus", kindly, benevolent, and the Olde English "cot, cote", as above. Hence the name is a hybrid Cornish/Anglo-Saxon one, which is found in East Cornwall where the Anglo-Saxon language first supplanted Cornish. Early recordings include the christening of Ambrosius, son of Stepheni Ellacott, at Kilkhampton, Cornwall, on March 25th 1543; and the christening of Elyynor Ellycott, daughter of John Ellycott, on November 16th 1550, at St. Neot. The first recorded spelling of the family name is shown to be that of Robert de Elcote, which was dated 1273, in the "Hundred Rolls of Wiltshire", during the reign of King Edward 1, known as "The Hammer of the Scots", 1272 - 1307. Surnames became necessary when governments introduced personal taxation. In England this was known as Poll Tax. Throughout the centuries, surnames in every country have continued to "develop" often leading to astonishing variants of the original spelling.